It isn't just the 'big kids' in the Governor's race between Governor Pat Quinn and Republican candidate Bruce Rauner who are calling on one-another to release various data points including tax returns for some of the candidates. 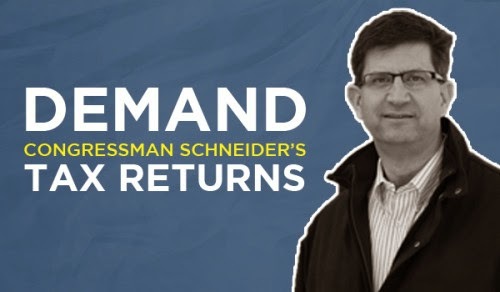 Now, former Congressman and current Congressional Candidate Bob Dold is calling on his opponent - incumbent Congressman Brad Schneider - to do the same thing: release his tax returns. With the tag line: "If he's going to raise taxes on you, then we should know what taxes he pays", the campaign is up on Facebook encouraging supporters to join the cause and generally trying to make hay of the issue.